Located in the historic riverside neighborhood of Manayunk in Northwest Philadelphia, the John Wilde & Brother Yarn Mill was the longest operating textile mill in Philadelphia when it closed in 2012 after 132 years of continuous operation. Widely known for their extensive variety of wool carpet yarns, which served Philadelphia’s once enormous carpet business, the family-owned Wilde mill has been a mainstay of Manayunk’s industrial landscape since it opened in 1880, commanding a prominent position at the southern gateway to the neighborhood. For its significance in the textile industry, the site was individually listed on the National Register of Historic Places in 2013. 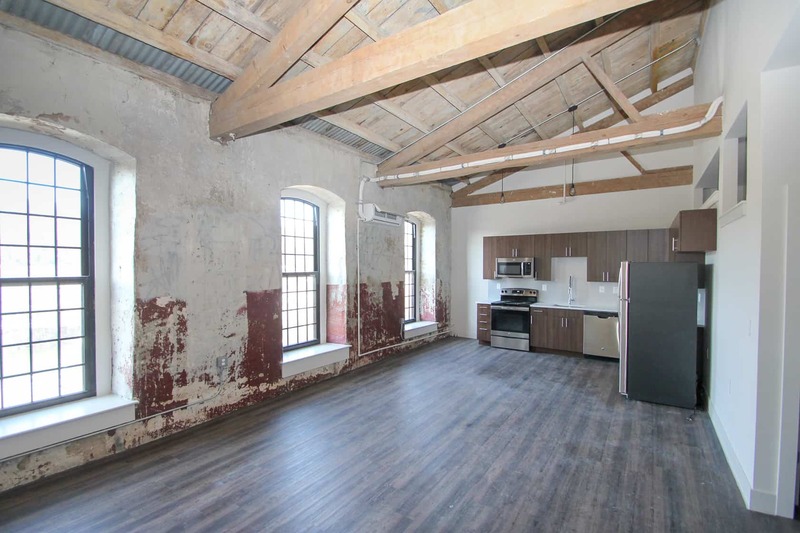 Using the Federal Historic Tax Credit, this project sensitively rehabilitated the site’s three historic mill buildings, converting formerly raw industrial space into modern apartments while preserving original wood floors, stone and brick walls, and character-defining heavy timber beams and trusses throughout. New windows were also installed to match the originals exactly. Although the buildings no longer play a role in the textile industry, the highly sympathetic nature of the rehabilitation work has ensured that the legacy of John Wilde & Brother lives on.